Harold’s Tap Room is a part of the Harold’s enterprise on 19th Street in the Heights. There’s Allie’s Pizzeria, Harold’s Restaurant, and now Harold’s Tap Room occupying the narrow space between the stairs and the pizzeria. I say narrow, but really, the bar is exactly what I want. First of all, Harold’s Tap Room is actually a bar. Not a lot of seating that isn’t at the bar. I like that. When I go to a bar, I want to sit at the bar, not at a table. Call me old fashioned, but I like bars. I love it when the bar itself is the largest thing in a place. Second, I like it that it isn’t that big. Because the bar occupies so much room, it means that the place can’t hold that many people. Even if it were crowded, it would still seem small and intimate. I like that, too. They have a whole selection of Chef Antoine Ware’s take on bar food, but I didn’t go there for that. I didn’t even try any of it. Like I said, I like bars. When I want a restaurant, I go to a restaurant. Man, I sound like an old curmudgeon. Young whippersnappers with their fancy chef hats! The first thing I noticed about Harold’s Tap Room, however, was the music. First, there was Motley Crue’s “Girls, Girls, Girls.” Then “Don’t Stop Believing” by Journey. And “We’re Not Gonna Take It” by Twisted Sister. It’s kind of what Harold’s is like. Not metal or anything like that. Heck, it’s not even what they normally play there. But it doesn’t take itself too seriously. It isn’t pretentious, thank God. 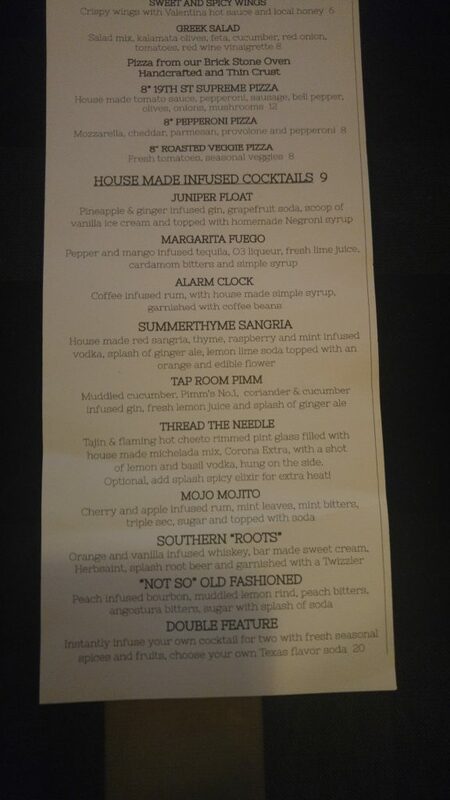 If you want a craft infused cocktail, they have you covered. But if you want a freakin Budweiser, they got you there, too. It’s a bar, even if it is a nice one, and anyone can go in a get a good beer or a good drink without having their tastes shat upon. It isn’t called Harold’s Tap Room for nothing. 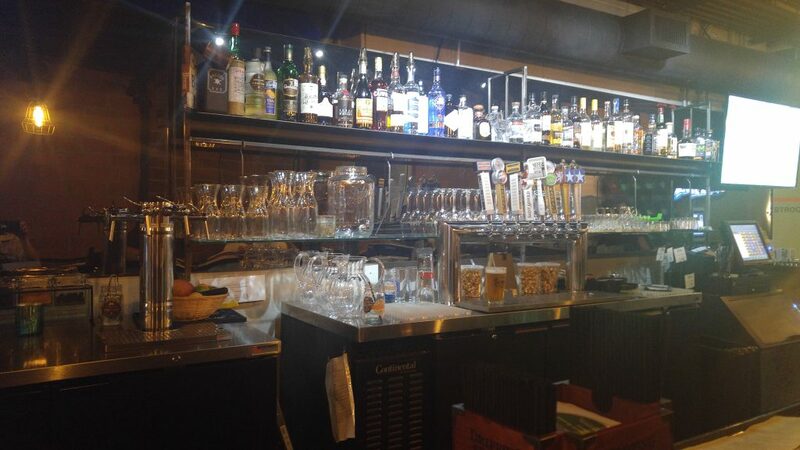 They have a pretty good beer selection, with eight taps and about that many wine taps (yes, they have wine taps). All from Texas: Karbach, No Label, St. Arnold’s, and two I had never heard of–Town in City and Stesti. So of course I tried the Town in City City Porter and Amber Pale Ale along with the Stesti Bohemian Pilsner and Lager. If you know anything about my tastes from reading this blog, you know I lean toward the bitter hops and away from the porter style. Yet the Town in City City Porter was great. It’s chewy and bready with dark chocolate and hazelnut flavors. The surprise was the Stesti lager. I’m not even sure exactly what it was called, but I loved it. Funky and malty, yet bright and drinkable. I would definitely order that again. I loved seeing Texas breweries that I had not tried before, and I commend the Harold’s crew for carrying local beer, especially good local beer. 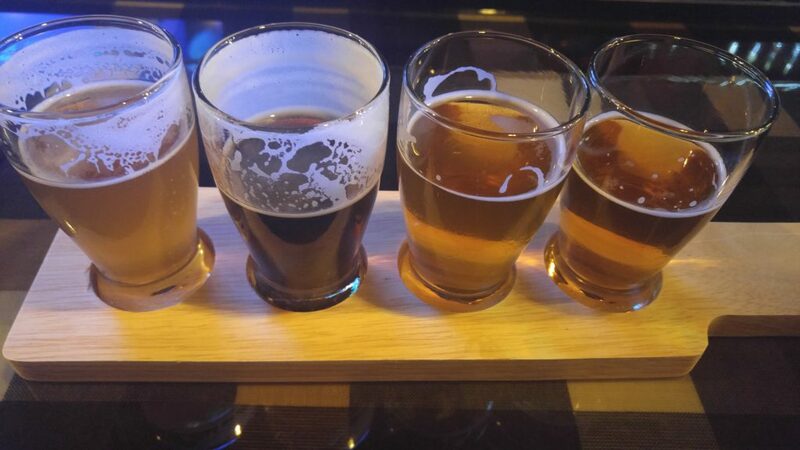 I also like it that they let you do a beer flight. For the same price as a 16 oz pint, they will let you have 4 4 oz glasses of any beer you want. That’s cool. I wish more beer places would do that. 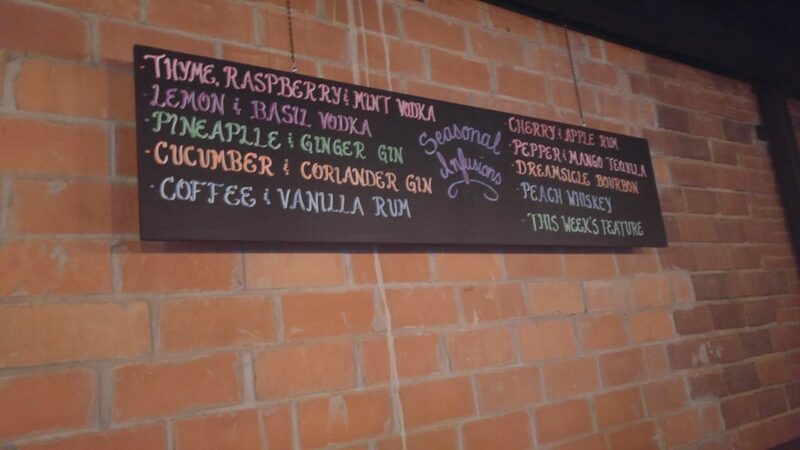 It may be called a Tap Room, but the infused cocktails are the star of the show. 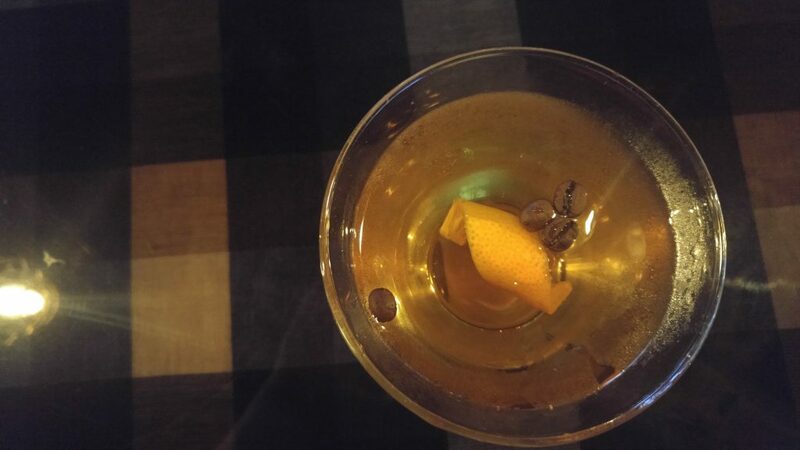 Lots of places may infuse a few spirits, but Lauren Muse, the bar manager and drink maester has built her entire program around infusing spirits. There’s all kinds of them. Thyme, raspberry, and mint vodka, pineapple and ginger gin, cherry and apple rum. The list goes on. You can make your own cocktail by telling them which spirit to use with which mixers, too. Me, I trusted Lauren’s muse and went for the published cocktails. First, there’s the Alarm Clock, which uses coffee infused rum with a simple syrup of both light and dark sugars, and a bit of Ancho Reyes, a spicy and sweet pepper liqueur that is popping up everywhere. Yes, I am a fan. 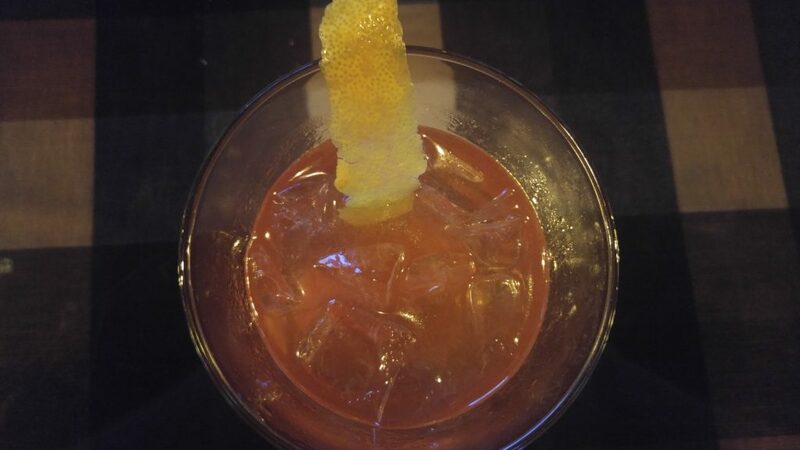 The cocktail is good, too. 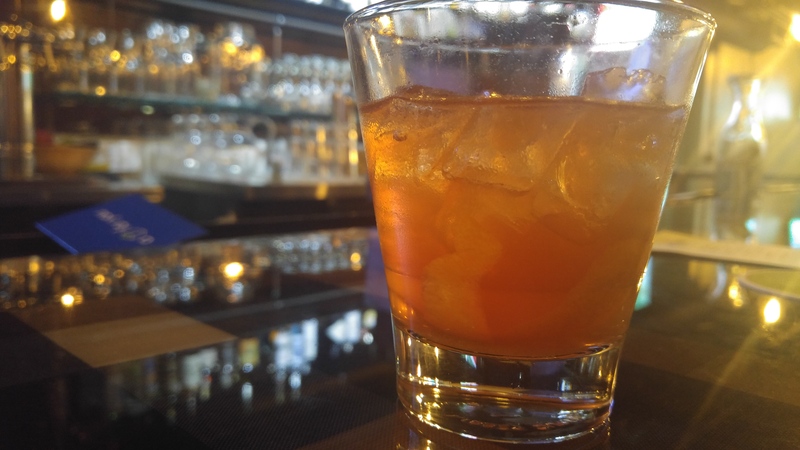 Then I had to try to Not So Old Fashioned, which uses peach infused whiskey, another fine drink featuring their infusions. I would recommend both of the drinks unreservedly, although I would perhaps reach for the Alarm Clock first. After all, it may wake you up. Something about the chili and coffee work perfectly. Overall, Harold’s Tap Room is a fine bar. Great cocktails, a good beer selection, an easy place to sit and talk while having whatever you want. They really do aim to please, and they’re doing it right.